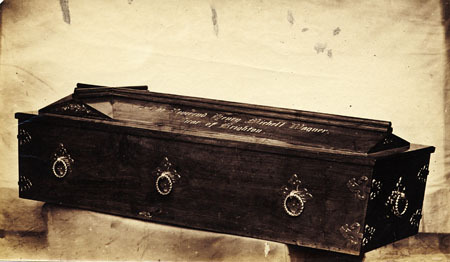 This photographic print shows the coffin of the Reverend Henry Wagner, Vicar of Brighton. The coffin bears an inscription and cross on the lid. It is situated on top of a stone plinth at an oblique angle. Henry Wagner served as Vicar of Brighton from 1824 until his death in 1870. During this period he funded the construction of numerous churches in Brighton, such as St Paul's, West Street. Although his policies were occasionally controversial, he remained a popular cleric. His funeral procession in October 1870 was a major event: local churches were draped in black, and large crowds of people watched the coffin's journey to the Parochial Cemetery. This photograph was probably one of several taken to record the event. Henry Wagner, Vicar of Brighton from 1824 until 1870, was born on 16 November 1792 at 93 Pall Mall, London, the son of wealthy hatter Melchior Henry Wagner and grandson of Henry Michell, Vicar of Brighton 1744-89. In 1823 he married Elizabeth Douglas and on 30 July 1824 accepted the benefice of Brighton and West Blatchington, but his wife fell ill after giving birth to their son Arthur (see “Wagner, Revd Arthur”) in the same year and eventually died in 1829. In 1830 he was appointed a royal chaplain and remarried in 1838, to Mary Watson who bore him two more sons but she died in 1840. At the beginning of Wagner’s incumbency there were just 3,000 free sittings in the town’s churches, despite something in the order of 20,000 poor people living in Brighton. Both Henry and Arthur Wagner devoted much of their lives to improving this situation, and Henry Wagner himself had six churches built, namely All Saints’, All Souls’, Christ Church, St Anne’s, St John the Evangelist’s, and St Paul’s; only two, St John’s and St Paul’s, survive however. The strong Tory opinions of Wagner often caused friction in the Whig-dominated vestry, and he eventually stepped down from the chairmanship of that body. There was also a considerable amount of antagonism towards him in the town generally, especially over his appointments at the town’s churches and over the church maintenance rates. The bad feeling reached a peak when he was convicted of assaulting a seven-year-old boy who had ridiculed him in the boy’s own home in Upper North Street; the vicar was fined £2. Unlike his son Arthur though, Henry Wagner was never a follower of ritualism. Wagner died on 7 October 1870 aged seventy-seven after forty-six years as vicar. All churches were hung in black and large crowds watched the funeral procession from St Nicholas’s Church to the Parochial Cemetery in Lewes Road. His bust may be found in Brighton Museum.